One of the most enjoyable things about watching a college football training camp is seeing a newcomer emerge that you’ve barely heard of. 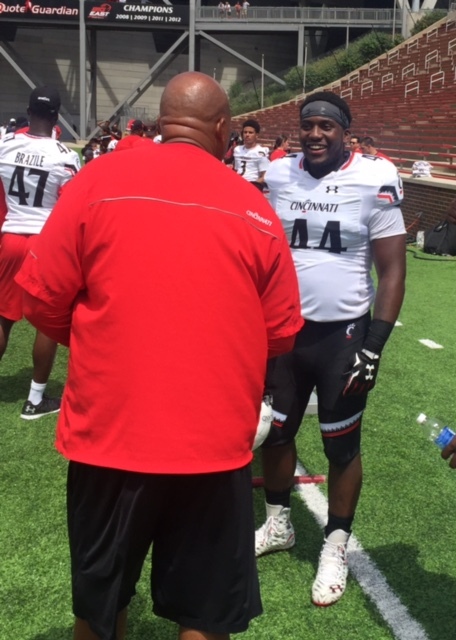 In the first week of Bearcats camp it’s been true freshman Marquise Copeland. Copeland started at right defensive end in Saturday’s scrimmage as Mark Wilson and Landon Brazile were kept off the field for precautionary reasons with minor injuries. That meant that Copeland was matched-up against First Team All-AAC offensive lineman Parker Ehinger. “I looked at that match-up and I said, ‘If I start him against Parker, how is he going to handle it?’” said Prunty. “I kept looking at his eyes when we were doing pregame warmups and he didn’t have those ‘wide eyes.’ That let me know how poised he was. Copeland is from Bedford, OH, a suburb of Cleveland, and chose UC from a long list of college suitors including Kentucky and Wisconsin. He frequently lined up in a two-point stance during Saturday’s scrimmage and showed a burst of speed in rushing the quarterback. Copeland looked like a linebacker when he signed with Cincinnati, but at 6’3”, 260 pounds that is no longer the case. I asked Mouhon how quickly Copeland caught his eye in training camp. The last two defensive players to start the season opener as true freshman for the Bearcats were Mike Mickens and Terrill Byrd in 2005. Copeland is hoping to change that. “I’m trying to work every day to get that spot,” said Copeland.